Before jumping deeper in to the SSC English 1st paper suggestion and question paper for 2020, let’s know some important facts. 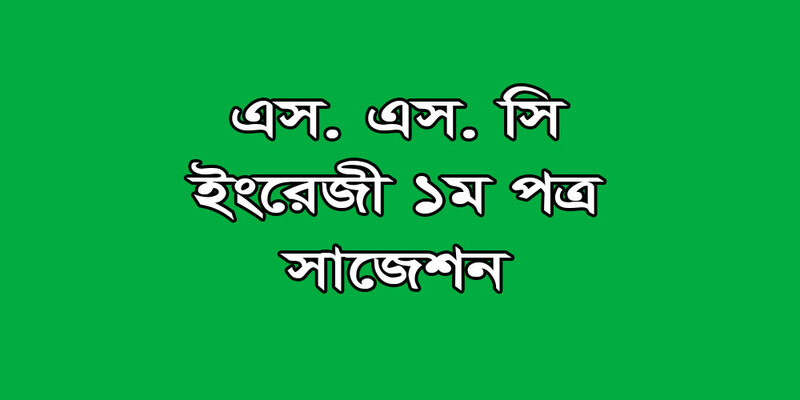 SSC exam is one of the most important and prestigious exams for the students of Bangladesh. Basically, SSC is the exam that decides your future as a college student. So, it is very important to do well in every subject of SSC if a student wants to get admitted into a reputed college. 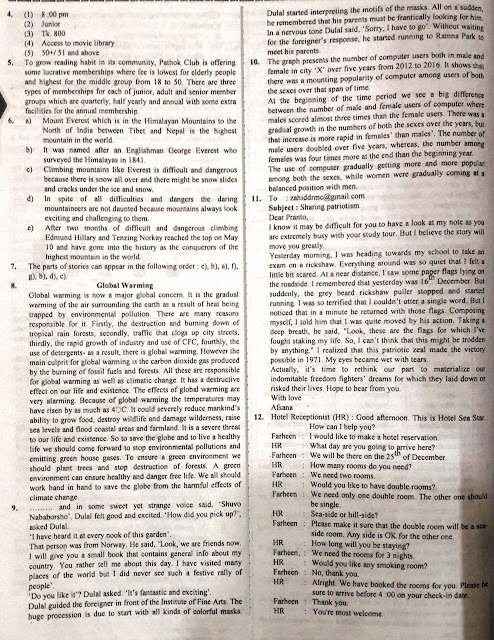 Among all the other subjects, English 1st paper is comparatively easy for those who have a little bit of knowledge about English. But as it is a foreign language and most of our students come from Bengali Medium backgrounds, they do badly in this subject due to their lack of information and guidance. So, without wasting more time on boring descriptions, let’s jump into the main segment one by one. 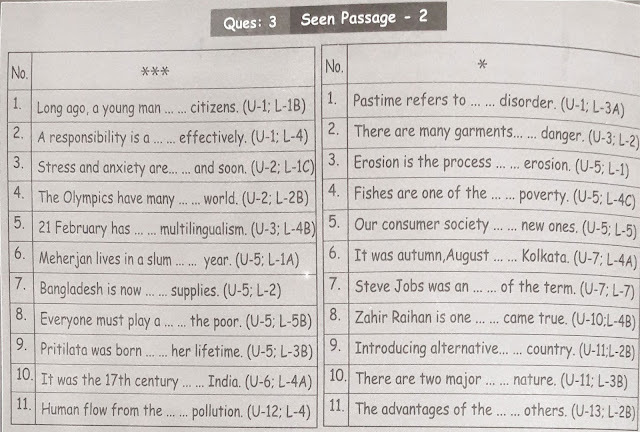 Having a good and clear conception of question pattern is very much important for a student of SSC, especially if it’s for English 1st Paper. If you have a good sense of question pattern then you can distribute your time in writing and revising. Otherwise, you will struggle with keep up with the clock. 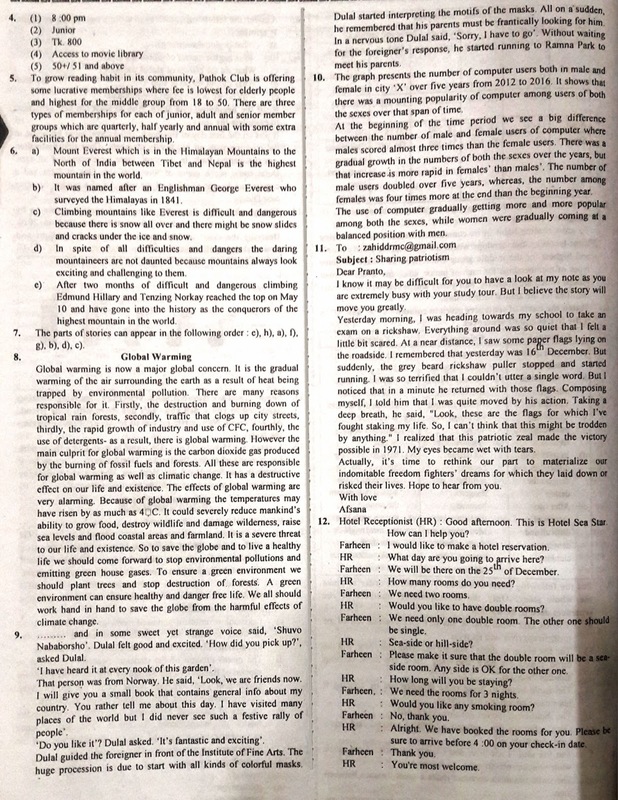 The first part which is Seen Passage contains 4 questions and Question no 1 and 2 will be set from Seen Passage as you can assume from its title. Question no 1 is ‘Choose the correct answer’will be of 7 marks. Question no 2 is ‘Answer the questions’ contains 5 questions and each of the five questions will be of 2 marks; in total 5×2=10 marks. Then comes the 2nd portion. 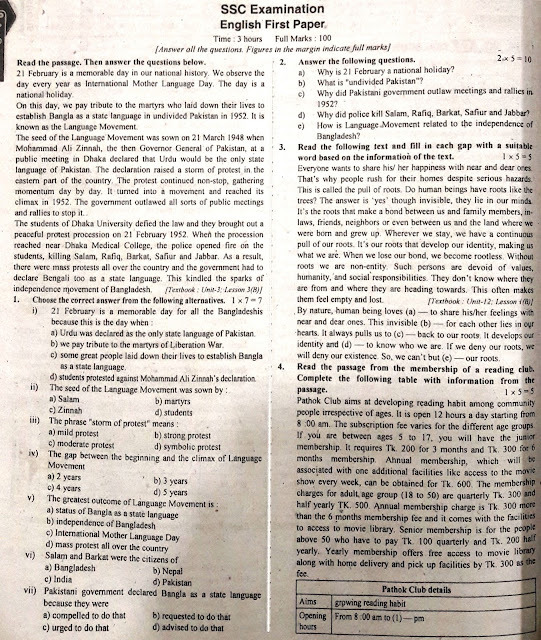 Question no 5 is‘summarizing’which contains 10 marks will be set from Unseen Passage. Question no6 is ‘Matching- Completing five sentences should be bearing 5 marks. Question no. 7 is re-arranging and it bears 8 marks. If you are from business/commerce group, I do believe you would like SSC Accounting Suggestion, SSC Business Entrepreneurship Suggestion and SSC Finance Suggestion. The last part begins from here on Question no 8. Question no 8 is‘paragraph writing by answering the questions’ which bears 10 marks. 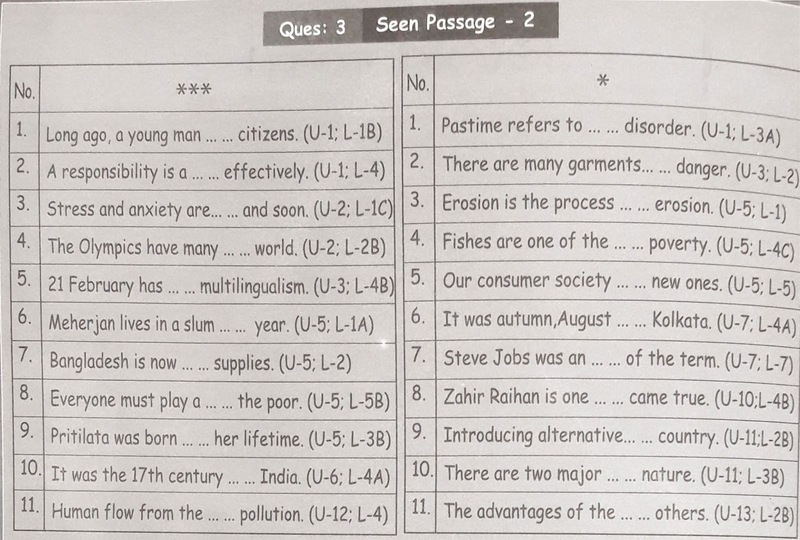 Question no 9 is ‘completing story’ containing 10 marks as well. Question No 10 is ‘Describing graphs/ charts’ and Question no11 is ‘Writing informal letters/ e-mail/ writing short dialogue’. All of the questions from 8 to 11 bears10 mark for each. Call it an irony of fate or a failed attempt of promoting education system, the Syllabus for SSC exams change more or less every year in our country. As a direct impact of it, students often find themselves in a tricky situation about what they should study and what they should not. English 1st paper is no exception in this case as well. That is why it is really important to know about your Syllabus for English 1st Paper if you want to obtain good marks in SSC. Make no mistake and go to Education Board’s official website and check out the syllabus. Or, you can simply download it from our page also. If you are from Arts/Humanities group, you may download the suggestions of SSC History of Bangladesh & World Civilization, SSC Bangladesh & Global Studies, SSC Civics, SSC Economics, SSC Geography & Environment. Taking model test exams is a very effective and reliable way to examine your preparations. Model Tests are like demo Final Exams which enhance your abilities to thrive in the exam hall. For your comfort and easy preparations, here we have given a English 1st Paper Model Test Paper. Take the Model Test carefully and enhance your qualifications in English 1st paper. If you do not have enough time to sit for a Model Test Exam, we have got your back too. Solve these quick Model Questions for English 1st Paper to make sure that you have taken the best of your preparations. Now, we will give you suggestions for English 1st Paper for every individual board. These suggestions are not any random assumptions; rather these suggestions are prepared by experienced and famous teachers from renowned schools and colleges of Bangladesh. 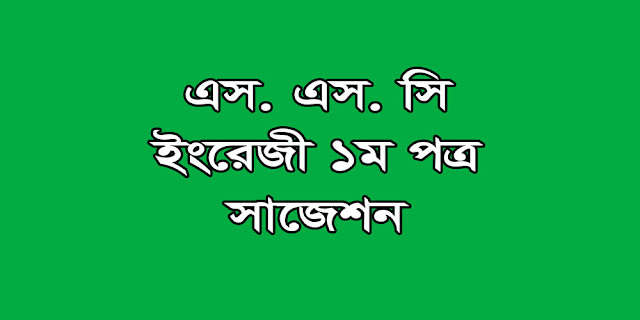 Dhaka board is known as the oldest and the biggest educational board in Bangladesh. As the members of biggest SSC exam community, the SSC Students of Dhaka board has to study more for doing good results and there is no alternative for that. Read these suggestions and you will walk one step ahead of your competitors in the exam. 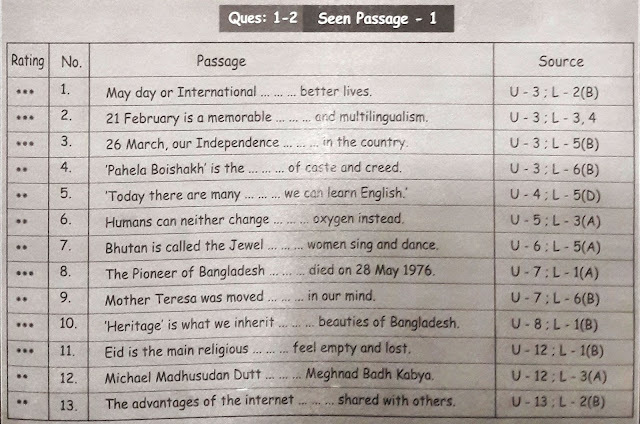 Please download the suggestions and solve them as these questions have been set by the experienced teachers from the Dhaka Educational board. 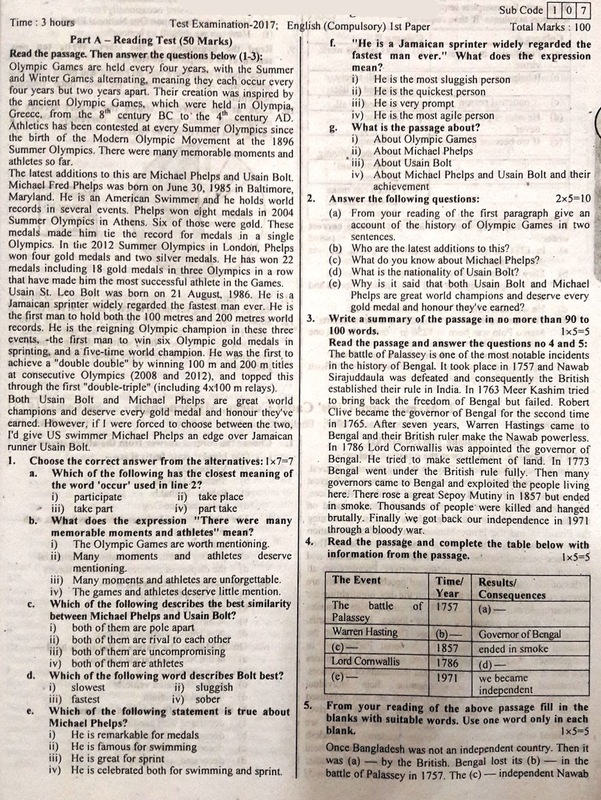 Also solve the previous year’s questions. 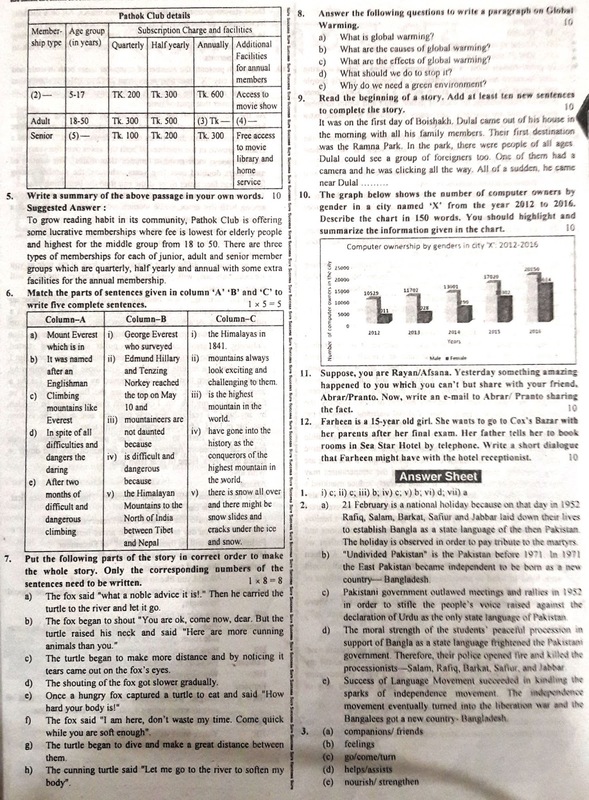 If you are a student under the Chittagong board, download the pdf of this suggestion paper and also revise previous year’s questions in order to get good marks in SSC 2020 English 1st Paper Exam. Rajshahi Educational Board is the Second largest board in Bangladesh when it comes to the number of total SSC candidates. That's why, just like Dhaka, students under this board also have to compete with a greater amount of competitors in order to secure good marks. 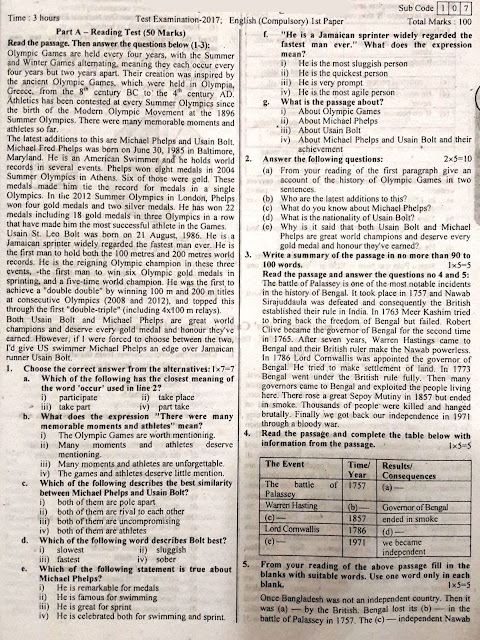 Download these Suggestions as pdf to do well and also solve previous year’s questions. 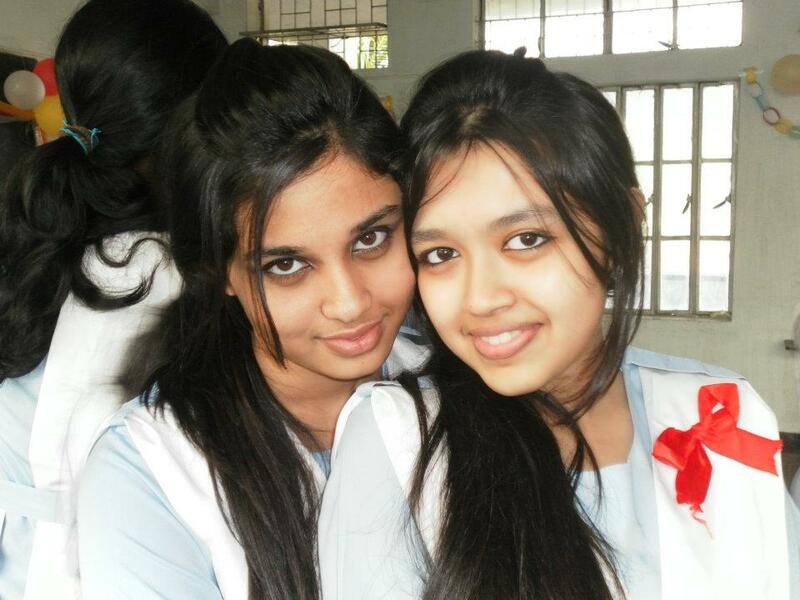 Students of Jessore board have a good reputation for carrying good marks, especially in SSC English 1st Paper. If you want to keep up this reputation, take a look at these suggestions given below and collect previous years' questions. Download these suggestions and previous years' question papers if you want to obtain good marks. And like other boards, also revise previous year questions. Although Dinajpur board is a new board among other educational boards of Bangladesh, the students under this new board are showing remarkably good results in SSC. Download the pdf file for Suggestions from here and download questions from previous years. Download these suggestions from here for this exceptional board and solve previous year’s questions. Technical board is a bit different than other boards. That's why downloaded these exceptional suggestions for Technical board and solve previous year’s questions. Questions of SSC 2020 English 1st Paper will never come out of the NCTB Text Book for English 1st year which is known as the “English For Today”. It has been clearly instructed to the teachers and question makers that they shouldn’t set questions out of the text book. That is why; if you want make good results, do not choose short notes over he NCTB Text Book for English 1st Paper. However, it is undeniable that short notes are life savers but it can never be more important the text book itself. It is a matter of great loss that in the previous years, there have been incidents where main question papers for SSC English 1st Paperhave been leaked online. Who did this or why they kept repeating this heinous act is still a mystery. Many frustrated and innocent SSC candidates have fallen as the victims of this act. Many of the students spent hours and hours on Facebook and other social media sites with a hope to find these leaked questions. However, most of them wasted their time on nothing and obtained miserable marks. Be wise and solve the final suggestion instead of following any sick trend. There is no honour in cheating and parents should discourage their children from looking for leaked questions. Final suggestion doesn’t mean the manuscript of final question paper. There is no doubt that these suggestions are very important and there is a big chance that all of the questions will come from here. But as question papers are never predictable, it is very much possible that questions may come out the final suggestions as well. That’s why, again, solve these final suggestions but do not neglect the text book.